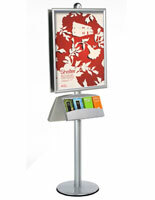 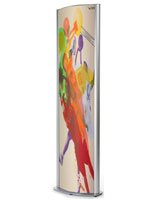 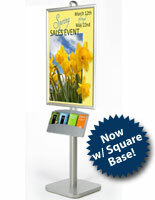 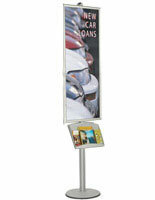 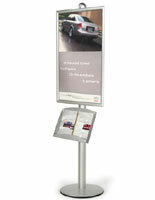 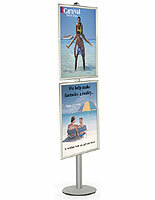 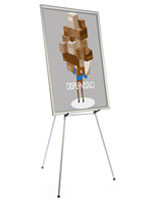 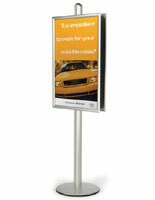 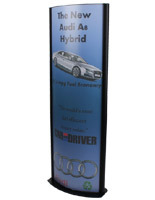 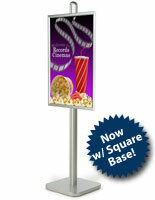 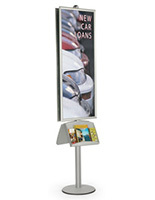 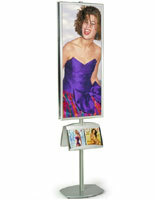 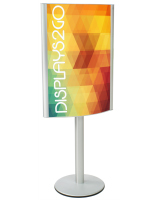 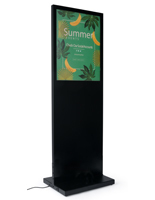 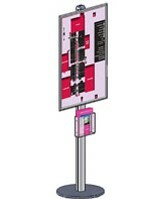 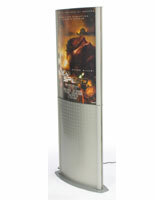 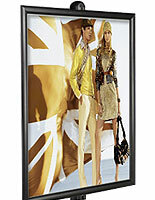 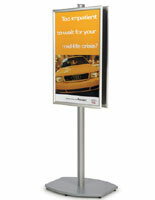 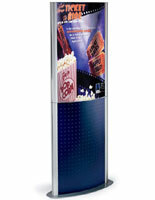 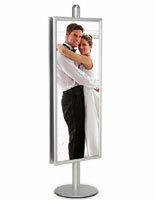 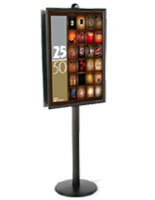 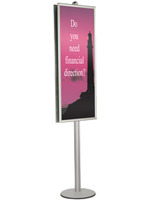 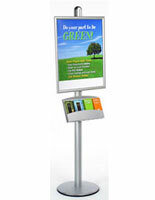 What are some of the attributes of the floor standing snap poster frame stands offered here? 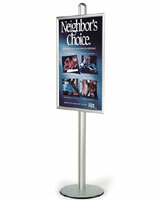 These framing fixtures showcase oversized messaging with a small footprint! 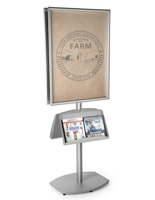 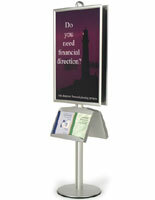 Many of the snap poster frame stands, also known as advertising enclosures, have pocket attachments for take-home publications. 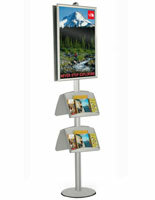 Floor racks are easy to set up, and spare the walls! 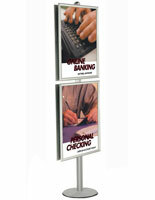 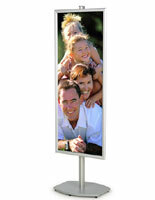 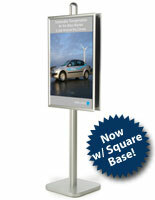 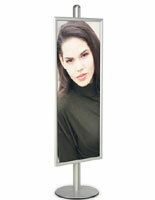 These snap poster frame stands that are picture enclosures come with round, square, fold-over, or a-frame bases. 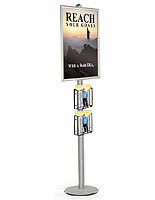 These print holders can be same-day shipped when in stock! 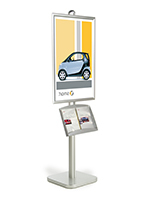 These snap poster frame stands come in large-format sizes, 22" x 56" and bigger, to suit advertising needs for store, office, or exhibit. 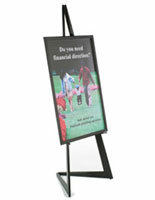 What different types of sign frames are available at this website and how are they used? 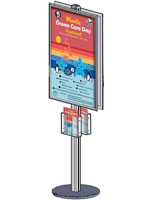 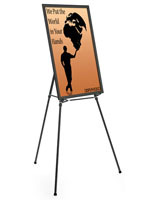 The snap poster frame stands available in this category include fixtures that are 22" x 56", 24" x 36"; 24"x 72"; 18"x 72", plus super-tall poster racks sized 8'! 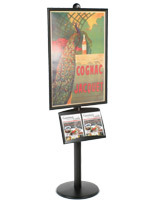 This eye-catching framing is typically spotted at malls, retail showrooms, convention and exhibition centers, trade shows, movie theaters, hotels, & music halls! 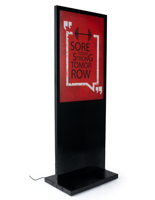 This signage is made of sturdy materials like wood, acrylic, plastic, aluminum, and metal; some models are illuminated to draw even more attention to your advertisement! 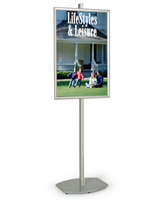 Some of these fixtures are weather-resistant for placement outdoors. 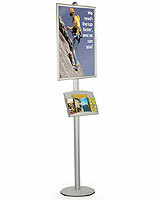 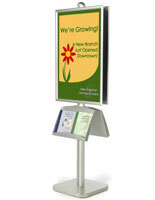 Others frame stands have brochure attachments for “take-one” collateral publications that reinforce brand. 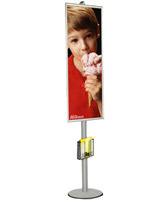 There are models with casters, while others without wheels weigh under 10 lbs. 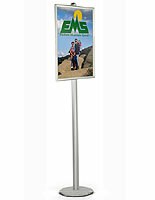 for easy carrying! 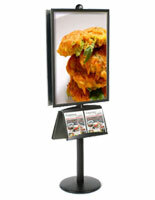 Whether choosing a-frame or snap-open technology, the vast selection won’t disappoint! 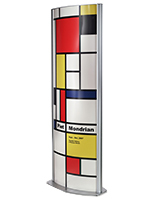 From floor-to-ceiling mounts, to diamond-shaped plate panels, there are durable stands with fresh, modern designs to suit any décor! 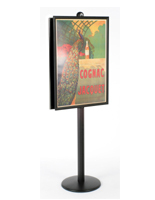 Buy single- to double- sided LED illumination racks with blue square or silver diamond panels to make a bold statement in an upscale hall. 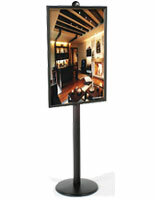 Select a fixture with a bi-fold design and wood finish for a simple, elegant statement. 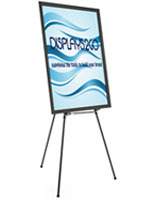 Shop this website for quality advertising fixtures and ask about same-day shipping!